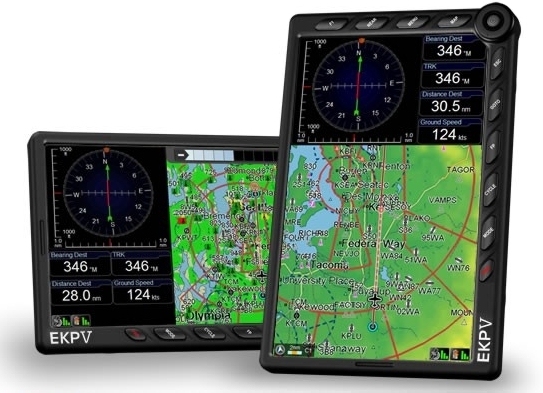 The AvMap EKP-V has a brilliant 7" display, with built-in battery and GPS, and is only 0.8" thick. The EKP-V is slim and light, yet very powerful: with built in u-blox 5 GPS receiver, built-in battery and speakers. AvMap EKP-V complete package . . . The AvMap EKP-V can be mounted vertically or horizontally. Fully portable, fully featured! AvMap presents EKP V the next step in the evolution of aeronautical GPS, redefining the role of the GPS inside the cockpit. A brilliant 7” display, with built-in battery and GPS, only 0.8” thick. EKP V is slim and light, yet very powerful: with built in u-blox 5 GPS receiver, built-in battery and speakers. Thanks to the special Docking Station, you can connect EKP V to several on-board devices at the same time (autopilot, XM WX, CAS, EIS, EFIS etc.) so that the large 7” LCD becomes multifunctional and capable to display different flight info. Easily change the layout choosing what to see and where to display it: maps, taws, weather, vertical profile on map, nav data, HSI, EFIS. Set different PROFILES for different aircrafts with different settings for taws, selective display and even different hard keys configurations. The new practical keyboard includes a configurable key, a progressive jostick and a smart wheel selector. Ease of use is ensured by the new graphic interface and the full qwerty virtual keyboard. EKP V maps are highly detailed and complete with Jeppesen Data, Low airways, private airports, the Seattle Avionics’ ChartData with 32,000 geo-referenced approach charts and airport diagrams for USA and Europe, Vertical obstructions, VFR Reporting points and detailed Terrestrial Coverage. display... color LCD TFT 7" 16:9 Format. 4.75" x 7" x 1.5"